We strategically planned our trip so that we would end on a beach for a few days - and we're so glad that we did. With all of the driving and touring throughout the week, we were looking forward to just settling down, unpacking our bags and not doing anything. Penang is an area on the eastern coast of Malaysia, up near the border with Thailand. We stayed near a port city called George Town on a beach called Batu Feringgi. The beach itself wasn't amazing, but our hotel's pool provided the relaxing backdrop that we needed. 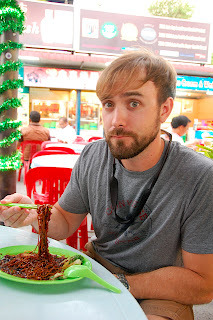 Other than sitting by the pool we took a half-day tour of George Town to see the colonial town and we frequented a few "food courts" that were probably the highlight of Penang. On our George Town tour we stopped at this Thai Buddhist temple which certainly reflected the distinct style that we'd encountered before. Inside there were several money collection boxes, all promising blessings in exchange for donations. 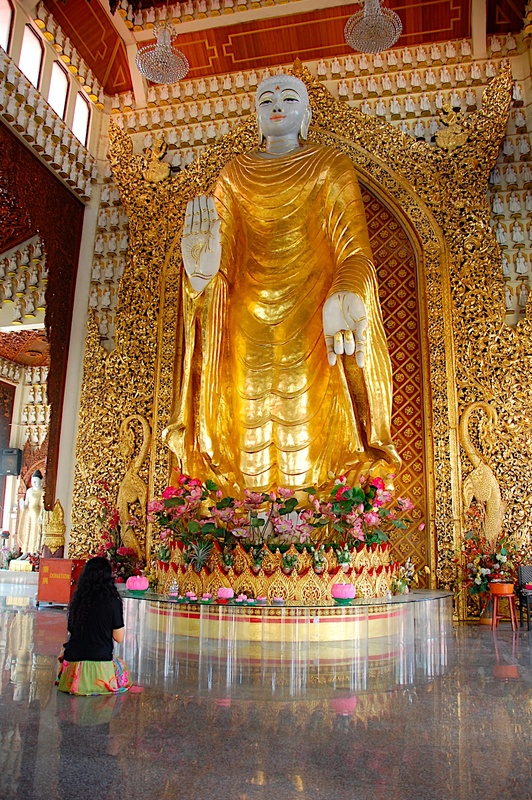 This has been my impression with Buddhism and that is one major problem that I have with the doctrine - there is a general theme of you doing something in order to get something. Directly across the street from the Thai Buddhist temple was the Burmese Buddhist temple that featured this huge standing buddha in contrast to the reclining buddha of the Thai temple. Once again there was a theme of donations for blessings. I liked this version though because they made it a sort of carnival game. They had about ten different metal pots that spun around the fountain, each with a different blessing. I drained a coin into the "happy marriage" pot from NBA range as shown, so that should keep us going for another year or so. Besides the murals they also had these iron framework sculptures that told a bit of the history of the town in a humorous, cartoon fashion. We also visited one of these "clan houses" from one of the more famous clans of China. 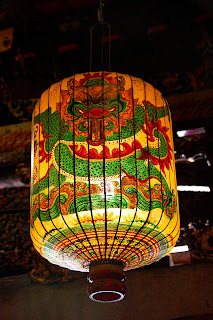 Since there were many Chinese immigrants to Malaysia there is a clear influence on the culture. Inside they had decorative murals and sculptures and a museum about the clan history in the lower floor. We also stopped into a preserved house of an old wealthy family to show how life was in George Town for the upper class. ...the Red Garden!! Don't worry, Marisa had the food guide so we knew what to get. These fried noodles were a start, but not my favorite. The way the food courts work is you pick a table anywhere you like and note the number. Then you peruse the various vendors along the outside selling specialties of Malay, Chinese and Indian styles. Place your order and tell them your table number then they bring the food right to your table and you pay there. Separately there is usually a drink vendor that stops by to keep you full on cheap Asian lager. Another unique dining experience is the "asam laksa", which is basically this vendor who gives you a plate or bowl of rice and dumps whatever you want on top of it. They may have a dozen or more different dishes and you just keep telling him what to throw on top. 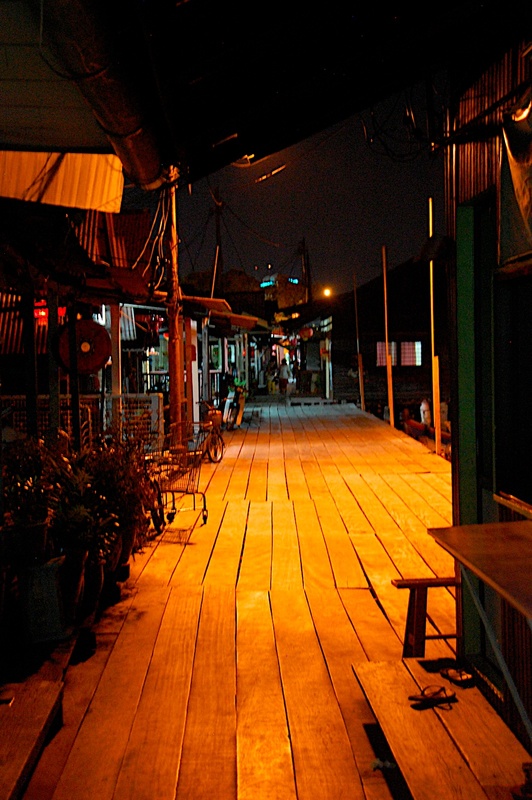 There is also a unique community in George Town that lives out on a jetty. It's basically a village of Chinese families that live out over the water. Everything was closed down by the time we made it there at night, but I think we also got a realistic view of what the day-to-day life is like here. 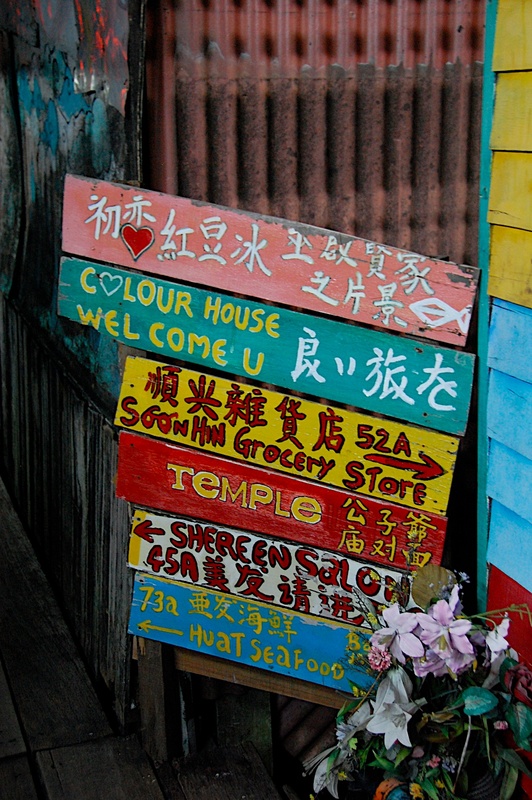 Colorful signs direct you to anything you need in the jetty village. Our beachfront view of Batu Ferringi, which translates to "Foreigner Rock" or something like that. We had a great time on our week-long sojourn of Malaysia and it ended on a great note. 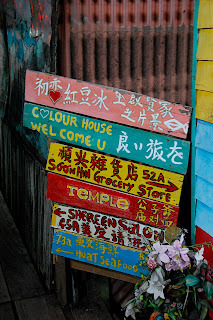 We had just enough relaxation in Penang to make it feel like a vacation before heading back to Hong Kong. Our interest was certainly peaked and we're considering a future trip to the other part of Malaysia on the island of Borneo.